Ok, ok, so the title of this post is pretty misleading. Trekking up to 4130m in the Himalayas is not easy, but when the opportunity to quote the Jackson 5 arises like this, it can’t be ignored. And there were some aspects of this trek that legitimately were easy, such as the feeling of bliss and peace that comes while sitting on a rock, breathing mountain air and staring at one of the highest peaks in the world surrounded by the sounds of running rivers, crackling glaciers and scurrying field mice. However, that feeling comes after days of endurance testing, shoulder squashing, lung expanding, calf numbing climbing. The adventure started early Monday morning with me throwing on my backpack and trudging through Pokhara at 6:30am in search of a bus (or as it turns out, 3 buses) to Nayapul. One thing to be said about riding local buses in Nepal; they rarely arrive on time, but they certainly know how to load as many people as possible in, and not one of those people complains when the inevitable breakdown happens. After arriving at the less-then-inspiring town of Nayapul and checking in with the TIMS racket (trek information management system…just a really fast way to empty the pockets of trekkers) I was off into the Annapurna Conservation Area by 10am. I had decided to do this trek on my own, without my friends or a guide. This was a decision that I did not arrive at lightly. In the past (and still in secluded areas), solo female trekkers were frequently targets for all kinds of nasty occurrences. After talking with some great people who had just finished the ABC trek alone and drilling them for information, I decided that on this particular route at this particular point in time I should be ok. 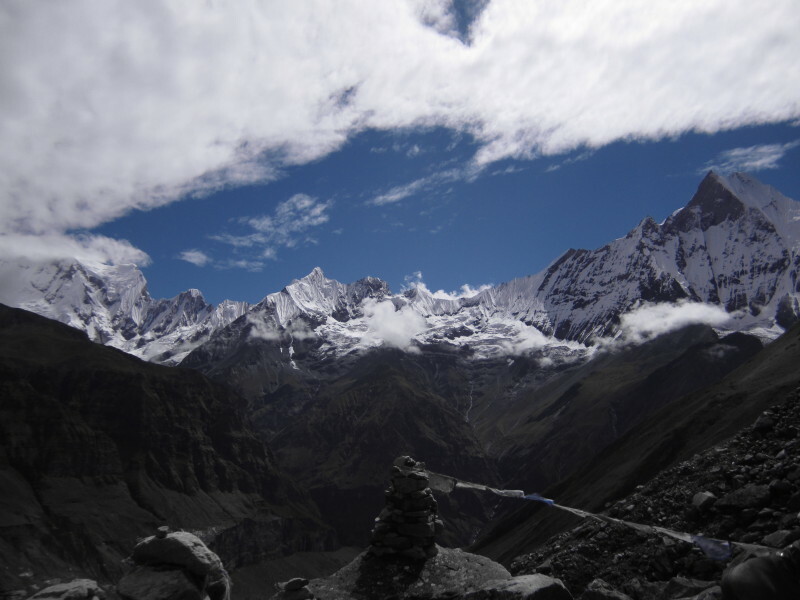 This is the second most popular trek in Nepal, falling behind only the Everest Base Camp, which means that the path is generally fairly obvious and that the chance of crossing paths with others is high. During the high season, the Base Camp has 100-150 people staying each night. As this is still monsoon season, I was lucky enough to avoid those crazy crowds and truly experience solitude on the path, while still meeting other trekkers during the evenings. It turned out that I couldn’t have chosen a better time. Monsoon season keeps most travellers away until October, as the idea of hauling yourself up a mountain covered in leeches and soaked to the bone only to arrive and see nothing but clouds does not appeal to many people. This was the experience I had accepted was most likely to happen, and I was ok with it. However, this was certainly not the experience I got. From the moment I left Pokhara, I was in a magical bubble of incredible good luck and a perfect amount of sunshine. The first day I managed to pull myself from Nayapul, through Komrong Danda and up up up to Chhomrong. 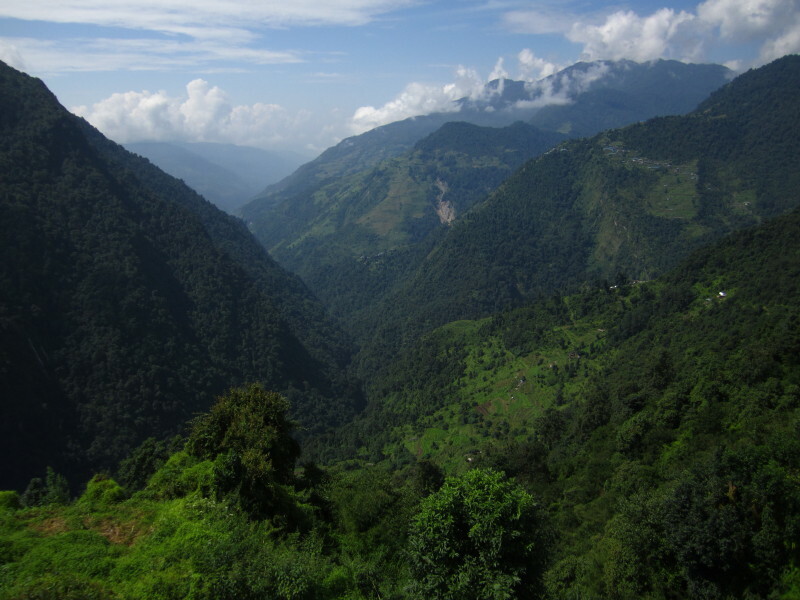 Interestingly enough, it seems that walking in the Himalayas is not a flat experience…go figure! This first day took 9 hours, and saw me through more intense ups and downs than a manic ward in an institution. Although this kind of walking is physically exhausting, it is far more of a mental game. It is callenging to keep the mind focused and positive when starting up a steep, rocky and seemingly endless climb all the while knowing that once this section peaks, there is a very quick descent only to have to make up all of that elevation once again. I arrived in Kimrong Khola (deep in a valley) at 5pm and had to make the decision to either spend the night here and climb the steep path to Chhomrong first thing in the morning, or to keep going on very tired legs and risk ending the day in the dark. For some reason, I decided to keep going and test myself. 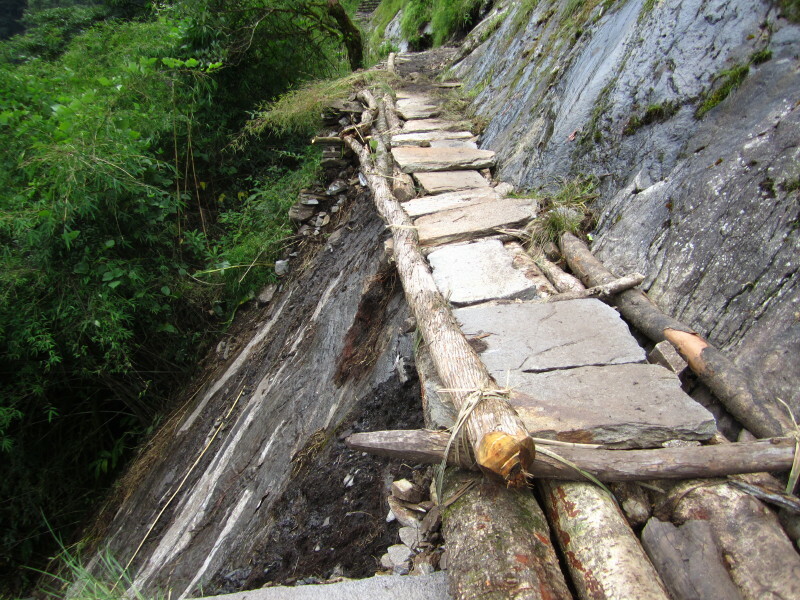 The path was thin, steep, very rocky and occasionally missing due to landslides. I could keep track of my progress by looking across the valley and seeing how high I had come. After I was about a third of the way up the hill, something inside of me clicked into action and I felt like I was on top of the world. I could do anything! I was killing this last climb of the day and I felt a sense of accomplishment that I have no idea how to explain. Suddenly, I was half way up, then three quarters, and before I knew it, I turned a corner and saw the trail flatten out and wind into Chhomrong. I had made it! Not once did I doubt myself, I simply focused on the task of getting up that hill, and suddenly, there I was. I spent a good amount of time that evening thinking about so many of the other challenges in life that I have over-thought and convinced myself I wasn’t capable of rather than tuning out that voice and simply going for it. What a dramatic and memorable way to learn this lesson. As if this realization wasn’t enough, the morning brought beautiful views of the rugged peak of Machapuchre (Fishtail) and snowy Annapurna South. I stood staring at them in a state of disbelief. 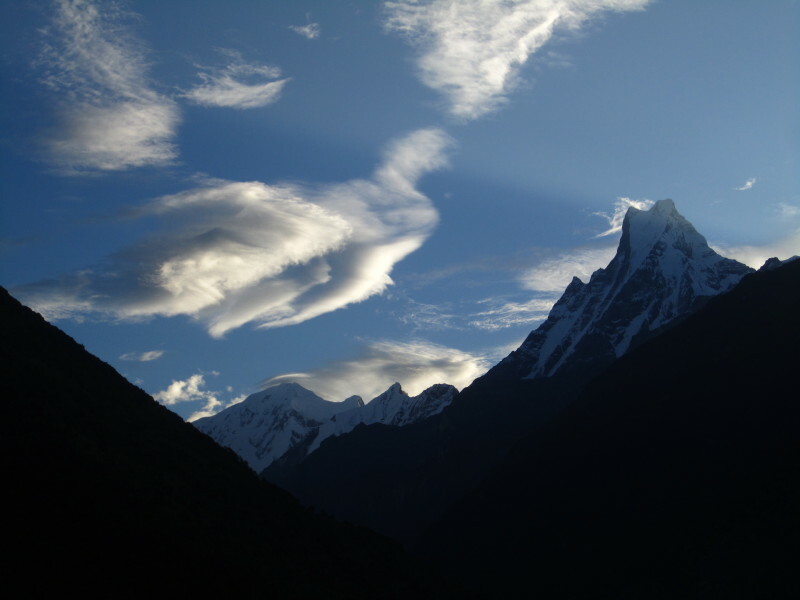 This is monsoon season after all…the peaks are a rare sight! It was almost as if the emotions I was feeling were being mimicked by the environment around me. This trek was already more then I could have hoped for, but little did I know that this was only the beginning and that there were many moments that would absolutely blow my mind. From Chhomrong, I headed down to the river. Going downhill is a nice relief for the legs, but weighs heavy on the mind as every down means another up. In this case, the up was all the way to Sinuwa. In Sinuwa, I paused for a snack and some water and met Eva. She is from Prague and was walking with her guide Raz. We chatted for a bit and I instantly liked her, then we headed off on our separate journeys. 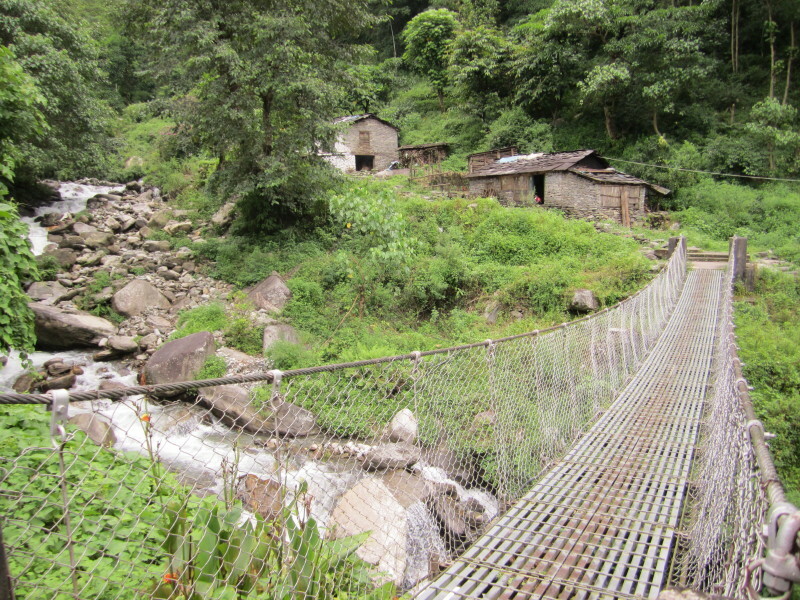 I had been hoping to make it all the way to Deurali, but around 2pm I was starting to drag my feet. I arrived in the “village” of Himalaya at 3pm and decided to rest before the final stretch to Deurali. 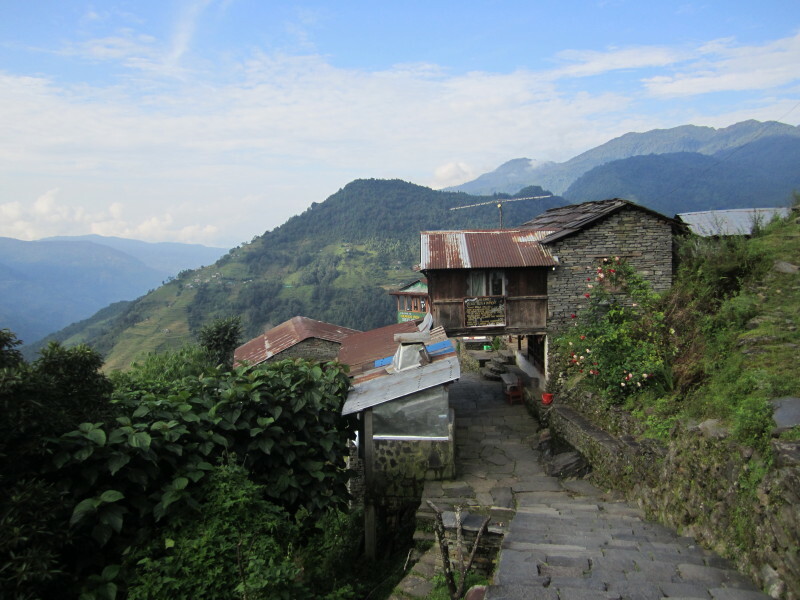 These higher elevation villages are really nothing more than two or three tea houses with bedrooms for trekkers. They are very different from the actual villages we had found along the Panchase trek and are simply a place to sleep and eat, not to experience any sort of culture. I sat down and packed myself full of snacks to propel me through the last hour and half or so. As I sat, the rain began, and as it rained, I got cold. I decided to stay in Himalaya for the night rather than try to push my cold and tired legs. Only minutes after I dropped my bag in my room, Eva and Raz arrived. We had some tea, some dinner and some amazing chats about almost everything that had been rolling around in our heads as we climbed. Eva and I seemed to click in that kindred travellers/long lost friends sort of way. In the morning we again had a tea together before I headed off down the trail, knowing I would again see her at the peak. Completely revitalized, I blew through Deurali and was off to Machapuchre Base Camp. The landscape started to change around me, going from lush wet forest to grassy, rocky mountain fields. 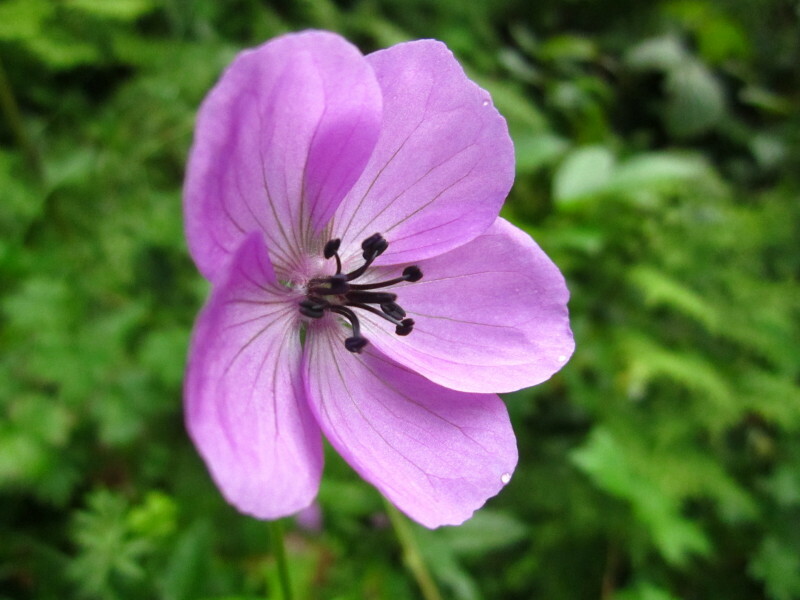 It seems as though there were new kinds of flowers everywhere I looked as I headed up along side the river. 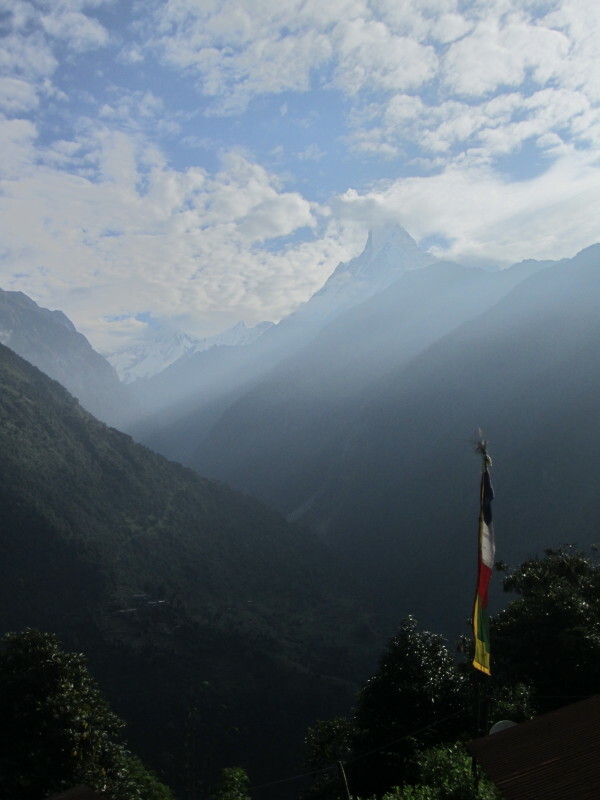 Looking ahead, I had a clear view of Annapurna III in the distance, beckoning me forward. I arrived at MBC in the glowing sun just before 10:30am and sat down to take it all in. Eva and Raz arrived, we kicked off our shoes and lounged for a while staring at the Fishtail peak in awe that would only grow as we kept going. The three of us headed off together for the final stretch up to Annapurna Base Camp. As we walked, we became completely enveloped in fog that made it seem like we were the only people in the world. Arriving in ABC was surreal. It was so foggy that we couldn’t see anything, but the excitement of having reached 4130m was more then enough for us. Shortly after we arrived, the rain began and continued throughout the night, leading us to assume that the morning views would be non-existent. We were both completely ok with that, as we had already seen so much more then either of us had anticipated. However, at 5:45am the rain stopped and the mountains began to come out of hiding. We were both in a state of awe that grew as the views got better and better. By 9am, we could see 9 stunning peaks in 360 degrees around us. Raz led us up another hill that took us to 4500m where we sat on rocks and stared out at our unbelievable surroundings for almost 2 hours. There were Tibetan prayer flags stretched out around us and stone structures that Raz said were each wishes of people who had been here before us. I built one of these with my sister in mind, and then as a good Canadian girl I built a little Inukshuk beside it. As we sat in silence taking in the mesmerizing mountains, there was a feeling of peace and contentment that seemed to flood every cell in my body. I wish I had adequate words to express this experience, or that a camera could capture what I was seeing. But there is no camera able to do this, and no words enough to fully explain these moments. 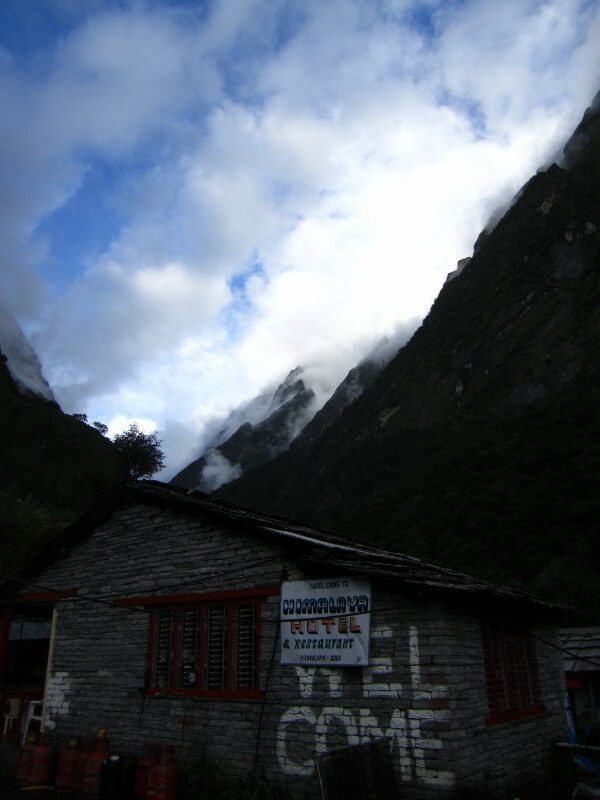 Eva and I spent 2 nights at the Annapurna Base Camp. On our second morning, we were once again greeted with a misty view of the peaks surrounding us. We began our descent down the mountain in the shadow of these giants. As we left the high elevation grass and flowers and became surrounded by the lush forests, the skies clouded over and I had my first rain hike of the trip. I threw on my super-fabulous styling poncho and continued on. We arrived in Bamboo and left the rain behind. Eva decided to stay here and rest/refuel for a while, but I was still feeling good so I continued on. Somewhere along the trail I ran into Isaac (whom I had met in ABC) and we continued on together, chatting about life, journeys and the motivations of travellers. We powered ourselves up the stone steps of Chhomrong and met PJ and Jack at the Chhomrong Cottage. We decided to crash here for the night and enjoy some of the greatest, softest, most delicious chocolate cake. Unfortunately, it was soon after we arrived that I finally had to admit I was sick. On the way to the top, my throat had been sore, then I started coughing. On the way down my head started to get heavy and after the cake, my sinuses turned on me. It was a painful night, but when I opened my eyes in the morning, I was greeted with another stunning view that somehow made me temporarily forget the pain. Soon, we were off again. Walking with PJ, Isaac and Jack was perfect. We all went at our own pace and simply met up when we arrived in a village. Before I knew it, we were back in Nayapul ready to head to Pokhara. As with everything in Nepal, the bus ride back was a memorable one. The stench of 4 hikers wasn’t really wanted in the bus, so we got up on the roof and spent almost 2 hours up there, taking in the scenery and the intense driving practices of Nepal. At one point, I heard Isaac say ‘Look out” and before I knew it I was sideswiped by some low-hanging bamboo. I found it pretty funny that my only injury of the trip happened on the bus ride back to town! It is strange being back in civilization after the solitude, beauty and peace of the Himalayas. However, the journey continues, and the trekking goes on. 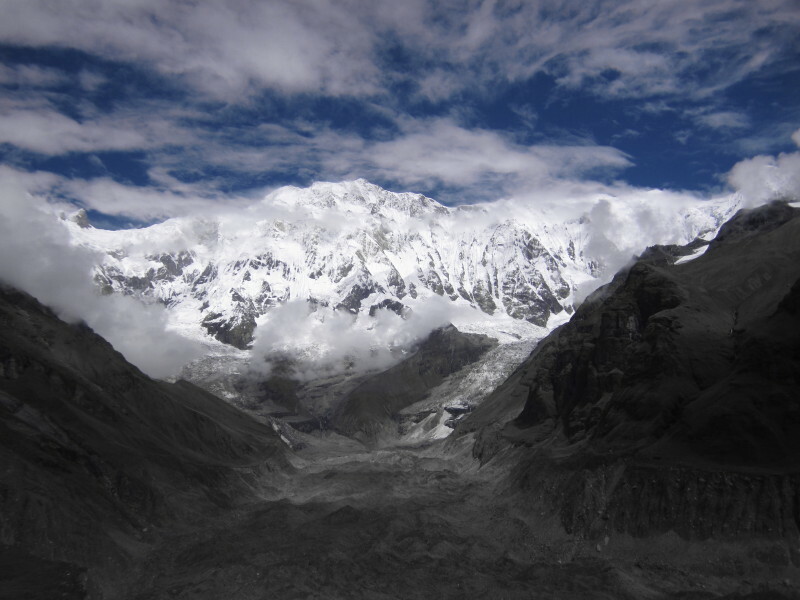 I’m now off to Kathmandu to prepare for a trek into the dry mountains of Lantang, near the Tibet border. I just can’t seem to leave Nepal! This entry was posted in Nepal, Traveling and tagged Bus, Himalayas, Nepal, Trekking. Bookmark the permalink. AMAZING story, thanks for sharing your journey. You’re right, no words or pictures could ever explain or describe your experience staring at those peaks. You didn’t really mention temperature, was it cold/mild/hot? At the low elevations is was pretty warm (I had the sweat stains to prove it…yuck! ), but at the base camp it was chilly for sure. Thank goodness for tea! I’m not sure what the temperature actually was, but it involved multiple layers of clothes. that is pretty cool! i am so proud of you and your accomplishments! that would take some serious physical and mental strength to trek up there, especially alone with only you to motivate you but i guess with the surroundings as they were that would be a pretty great motivator too! you be careful on those crazy bus rides! MISS YOU!!!!! just have to add – pictures are AMAZING!!!! and YES your ponchu was fantastic! Thanks! I had a 7 hour bus ride today that felt exactly like when we were little and played crack the egg on your trampolene. I was bouncing all over the place!